Learning what the performance bottlenecks and breaking points are. Finding the functional errors that only occur under stressing. Narrowing the safety gap for those working on or around the equipment. 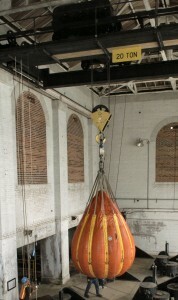 Lowering the frequency and serious nature of incidents involving the overhead cranes and hoists. The Occupational Safety and Health Administration (OSHA) has set forth certain rules and criteria for load testing as part of regular maintenance. Various degrees of qualification are necessary for inspection and load testing. A designated person is one appointed by management to be competent to perform duties as an operator. A qualified person is one who has special professional knowledge, training, and experience when it comes to overhead cranes and hoists. Experienced people like Moye Handling Systems can provide the expertise needed to pass OSHA-required inspections and the related load tests. Moye is a dealer, designer, installer, and inspector of cranes such as Demag – they only services overhead cranes and hoists, and thus over the past forty years have built a reputation for excellence when it comes to designing and implementing a load testing and inspection program designed to meet OSHA-approval standards and specifications. The timing of inspections and load testing depend on the equipment, frequency of use and conditions of the environment. Frequent or constant exposure to abnormal or nonstandard environments will necessitate more frequent attention. OSHA rules state that the hooks, hoist chains, wire ropes and all other operating parts should be visually checked every day by the equipment operator. Only a designated person may operate the crane and perform this normal service inspection. A more thorough inspection by a qualified inspector like Moye Handling Systems should be completed on a monthly basis with documentation to determine any degree of wear, tear, deterioration or malfunction, which should be made available to all equipment operators. Severe service load testing should be done at least quarterly by a qualified person who has professional knowledge, training and experience, like Moye Handling Systems. Severe service load testing means normal or heavy use in some irregular or nonstandard environment. This tests the equipments ability to perform in bad weather, unusually high or low temperatures, or during exposure to corrosive fumes, dust or wet, or otherwise hazardous environments. Heavy service load testing should be performed at least every six months to insure proper functioning of the equipment. Heavy service is defined as use at 80% to 100% of rated load, or in excess of 10 lift cycles per hour as a normal procedure. All load blocks must display this load rating. These, along with annual inspections, should be performed by an external certified crane inspector like Moye Handling Systems. Moye Handling Systems is there if you have an emergency, but it is best to have a system in place to determine if there is a hazard. The person you hire to operate your crane is ultimately the one who knows what is going on with it on a daily basis and knows if safety is becoming a concern. To ensure safe working conditions all the time, this person must be sufficiently trained. Moye Handling Systems not only offers inspection and load-testing services, but also further consultation in setting up your own inspection program, down to the paperwork and forms. Avoiding costly accidents and/or fines is central to your company’s bottom line. All safety and performance decisions ultimately translate into money and the justification for load testing is no different. Moye Handling Systems can help you achieve your goals where inspections, load testing and program designs are concerned.